The Federal Reserve Board of Governors is the governing body that guides the U.S. central bank. The board consists of seven members who each serve fourteen-year terms. Board members serve staggered terms. A new one is appointed every two years. Elected officials and members of the current administration are prohibited from serving on the Fed board. In addition to the board, the Federal Reserve System has two other components. The 12 regional Federal Reserve Banks provide services to the nation's commercial banking sector. The Federal Open Market Committee sets monetary policy. It controls the money supply and interest rates. Its dual mandate is to control inflation and reduce unemployment. All Fed board members sit on the FOMC, along with four regional bank presidents. The Fed has 1,800 employees that support the board. Its address is 20th Street and Constitution Avenue NW, Washington, D.C. 20551. The Fed's board structure was created to ensure its independence from politics. The president nominates potential board members, and the U.S. Senate confirms them. If the staggered schedule is followed, then no president or congressional party majority can control the board. This independence allows the Fed to focus on long-term economic goals. They can't be pressured to either raise or lower interest rates. Instead, they make all decisions based solely on economic indicators. President Trump is the first president in history to question that independence. In 2018, he publicly criticized the Fed for raising interest rates. He said higher rates slow growth and offset his attempts to spur the economy. When asked to name the single greatest threat to growth, he blamed the Fed. Trump stated that he wouldn't fire Powell. That raised the specter that's he's been considering it. A president can only remove a Fed board member for "cause," not a disagreement over policy. There is no law over whether Trump could fire Powell as chair. If he did, he'd have to get the Senate's approval for a new nominee. The Fed Board is led by a chair and vice chair. They each serve four-year terms. They serve in those positions while they are serving their board terms. The Fed Chair is Jerome Powell. He was already a Fed board member, serving from May 25, 2012, to January 31, 2028. He was a visiting scholar at the Bipartisan Policy Center, a partner at the Carlyle Group from 1997 to 2005, and a U.S. Treasury official under President George H.W. Bush. Each board member leans in a "dovish" or "hawkish" direction. Dovish members are more concerned about lowering unemployment than reducing inflation. They favor expansionary monetary policy and low-interest rates. Board members that are hawkish prefer contractionary policy. They would rather raise rates because they are more worried about inflation. Powell is dovish but is raising rates to more normal levels. President Trump appointed Powell as the Fed chair even though he is not in favor of deregulation, one of Trump's priorities. The Senate approved his nomination on January 23, 2018. Powell replaced Janet Yellen. He is continuing Yellen's successful policies. Yellen didn't serve out the remainder of her regular board term. The only Fed chair who did was Marriner Eccles, who served from 1934 to 1948. He stayed on the board for three years after his chairmanship ended. Chairman Powell also chairs the FOMC. He meets with the president, the secretary of the Treasury, and Congress. The chair is a member of the International Monetary Fund and the Bank for International Settlements. The person in this position is also the finance minister of the G-7 and G-20. Another Trump appointee is board member Randy Quarles. His board term is October 13, 2017 - January 31, 2032. He is also the Vice Chairman for Supervision until October 13, 2021. That position was created by the Dodd-Frank Wall Street Reform Act. He is expected to be named to lead the global Financial Stability Board by December 1. ​He supports bank deregulation. He was a managing director at Cynosure Group and the Carlyle Group. He was also a Treasury official under President George W. Bush. Neither dovish nor hawkish, he favors using strict guidelines that determine when the Fed changes rates. Trump also nominated Richard Clarida. He became vice chairman of the board on September 17, 2018. His term lasts until January 31, 2022. He was assistant secretary for economic policy at the U.S. Treasury from 2002 to 2003. He was a professor of economics at Columbia University. Clarida supports a "balanced approach" to the Fed's dual mandate. That makes him a hybrid hawk and dove. The third board member is Lael Brainard. Her term is June 16, 2014 - January 31, 2026. She is the only Ph.D. economist on the board. She was a senior Treasury official from 2010 to 2013, a senior member of the Brookings Institution from 2001 to 2008, and Deputy National Economic Advisor to President Clinton. She was a professor of economics at the MIT Sloan School of Management from 1990 to 1996. She is dovish. President Trump inherited a rare opportunity to stack the Fed board in his favor. The chair position came up for reappointment during Trump's term. Also, three board positions were vacant, including the vice chair position. Two of them have been vacant since the financial crisis. On November 15, 2018, the Senate confirmed Trump's nominee Michelle Bowman to fill a vacant board spot. She has the community banking experience Trump was looking for. She was the Kansas bank commissioner. Trump needed someone willing to divest their holdings in all banks. Congress made that a requirement two years ago. On March 21, Trump nominated former campaign adviser Stephen Moore. He believes the Fed should not raise interest rates further. Moore is a fellow at the Heritage Foundation and CNN commentator. If the Senate confirms Moore, five of the seven Board members would be Trump appointees. Trump had nominated Marvin Goodfriend in 2017 and Nellie Liang in 2018 for the two remaining vacant board spots. He is a Carnegie Mellon professor and former Fed economist. She was a former Fed economist who created the Office of Financial Stability. She was a senior fellow at the Brookings Institute and a consultant to the IMF. Both nominations expired in 2018 without a Senate vote. On April 4, Trump said he would nominate former 2016 presidential candidate Herman Cain to the board. Sexually harassment complaints ended his campaign. Cain was a Federal Reserve Bank of Kansas City board member beginning in 1992 and was its chairman from 1995 to 1996. Cain had also been director of the Kansas City Fed’s Omaha, Neb., branch. He was chief executive of Godfather’s Pizza from 1986 until 1996 and then led the National Restaurant Association. But there were not enough Senate votes to confirm him. The board has four primary functions. First, it guides monetary policy. All board members sit on the FOMC. The board has the majority of seats on the FOMC, so it effectively controls all decisions. It does listen to the input from the other members since they are presidents of the member banks. The FOMC meets eight times a year to set the target for the fed funds rate and to implement open market operations. The board alone sets the discount rate and the reserve requirement for member banks. Other monetary policies, such as the discount window, margin requirements, and reverse repos, also serve as effective Federal Reserve tools. Second, it analyzes economic developments. It releases the Beige Book monthly. It provides the monetary policy report twice a year, around February 20 and July 20. It reports its findings on the state of the economy to Congress. Specifically, the chair presents separately to the Senate Committee on Banking, Housing, and Urban Affairs and to the House Committee on Financial Services. Third, the board issues regulations for the general banking industry and for Federal Reserve member banks. It enforces those rules for the Federal Reserve member banks only. These include 900 state banks that are members of the Federal Reserve system and 5,000 bank holding companies. The Office of the Comptroller of the Currency supervises national banks. The Federal Deposit Insurance Corporation supervises state banks that aren't Federal Reserve members. This fragmentation allows banks to choose their supervisor by determining what kind of bank they want to be. That's one of the complexities that created the financial crisis. Fourth, it manages the U.S. payments system. The banks it supervises clear checks, process electronic payments, and distribute cash. The board meets twice a month. It addresses all regulatory and monetary policy. You may attend any open session. The board's meeting website has more information on its open and closed meetings. Sources: "How Is the Federal Reserve System Structured?" Federal Reserve. "Introduction to the Board of Governors," Federal Reserve Bank of St. Louis. "What Is the Purpose of the Federal Reserve System?" 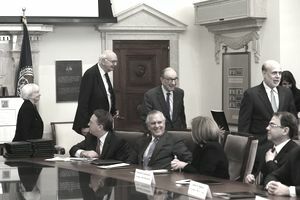 Board of Governors of the Federal Reserve.